So you guys….Cinco de Mayo is just days away….and once again, all my ideas of how I want to celebrate are going out the window. Am I the only one? Who has good ideas and good intentions and then just can’t make them happen?? Ever? I seriously can’t even tell you how many years in a row I’ve thought, “Oooh – Cinco de Mayo! Let’s celebrate!” With a party or a fun dinner or, at the very least, with margaritas and guacamole! But when is the last time we actually celebrated? Mmmm…possibly never. The best laid plans….. So this year I’m trying something different. I’m not even making plans! No, this year I’m using Cinco de Mayo as a starting point for a delicious summer menu. 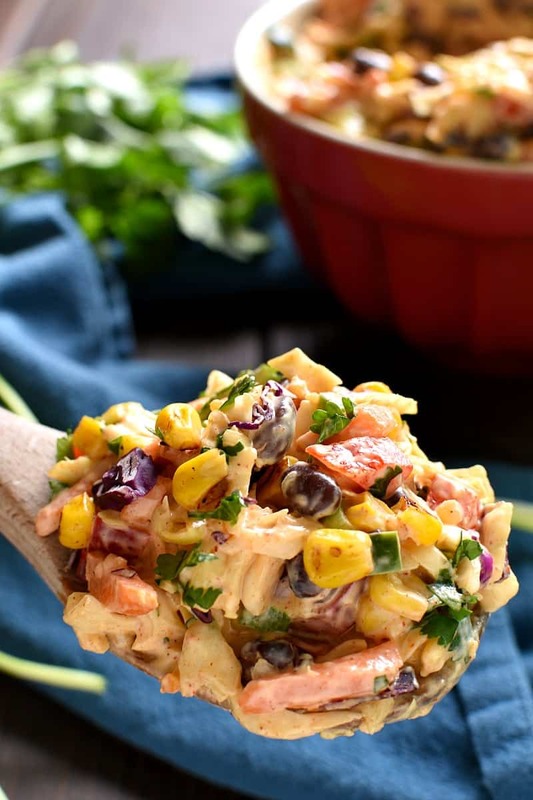 I’m making things like this Mexican Coleslaw and Mexican Street Corn Quinoa and Fish Tacos with Mango Salsa…and for a little something different? I’m giving Fruit Salsa a whirl. Without the pressure of making it ALL for Cinco de Mayo. No, I’ll be enjoying all of them ALL SUMMER LONG. Because if there’s one kind of food my family LOVES, it’s Mexican. 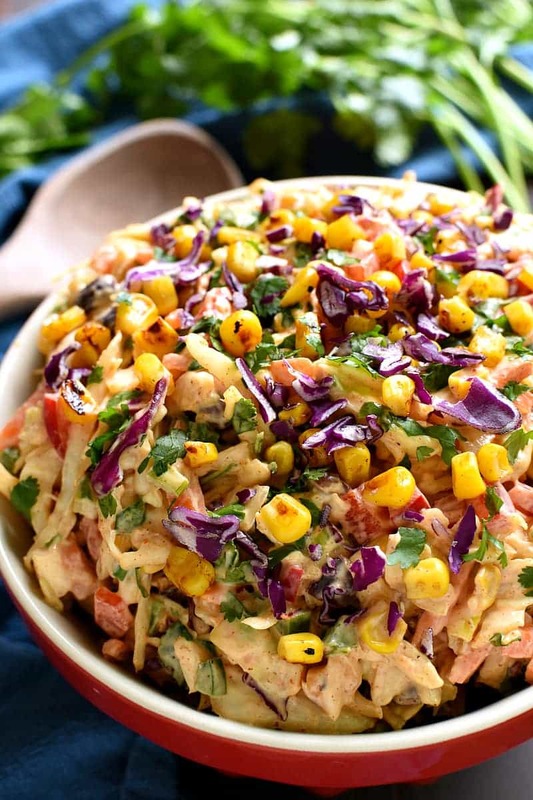 And this Mexican Coleslaw does not disappoint! It’s packed with so much delicious flavor and loaded with ALL the veggies…and it’s creamy, too. 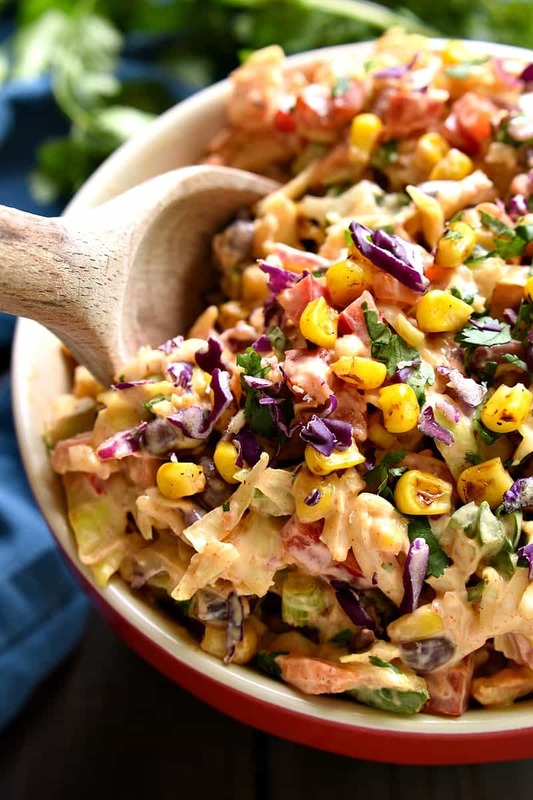 Which means this Mexican Coleslaw is on the fast track to becoming one of our favorite summer sides. And if you love Mexican recipes, I could see it becoming your favorite, too! So. What about you? What are your plans for May 5? Will you be going out? Staying in? Celebrating at all? Or are you smarter than me and don’t even make plans to begin with? Either way, this easy Mexican Coleslaw recipe will be here waiting for you to make it. And I have the feeling you’ll be making it all summer long….just like me. 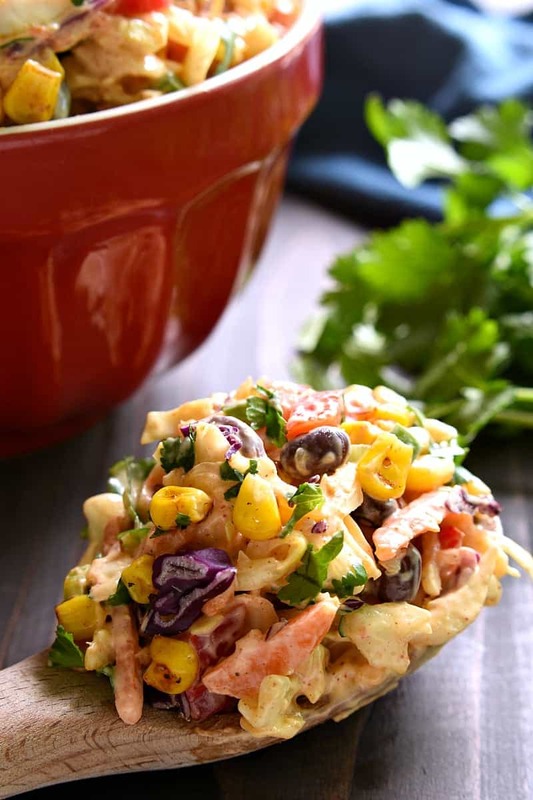 Taco Salad meets coleslaw in this deliciously creamy Mexican Coleslaw! Packed with flavor and perfect for summer cookouts! In a separate small bowl, combine mayo, sour cream, taco seasoning, and lime juice. Add mayo mixture to coleslaw mixture and stir to combine. I’ll be making this all summer! Looks amazing. I want to make this recipe as an appetizer. Chop the cabbage rather than shred and go for it. Will that work? Looks so delicious. Haven’t made this recipe but sounds delicious. This is such a perfect dish to take to a pot luck! Looks great! Whoa!! This looks amazing! I’m not sure I’d be able to share it with anyone else! I can’t wait to give this a try, soon! 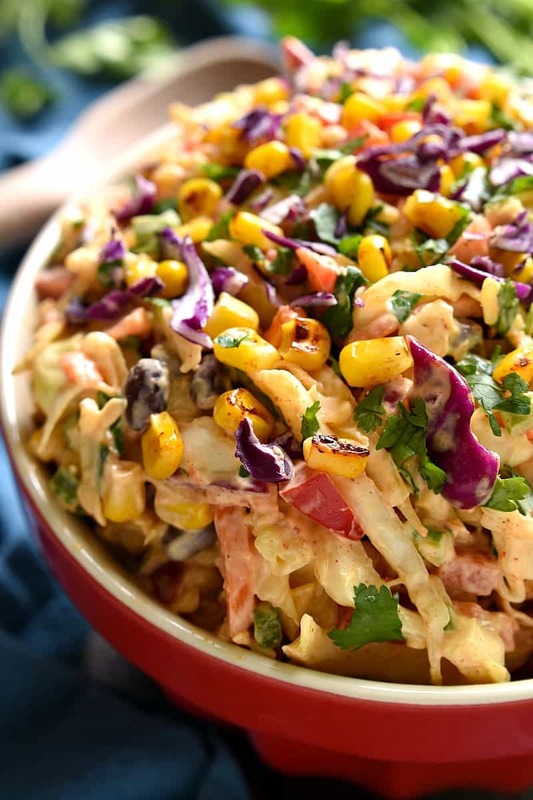 My plans have totally gone out the window, too… but this coleslaw looks all kinds of perfect for Cinco de Mayo festivities and eats. 🙂 We’ll have to try it! That sounds soooo good, I can’t wait to try it! This needs to be on everyone’s Cinco de Mayo menu! This would be perfect for our chicken tacos! Can’t wait to make a big bowl of this coleslaw! You’re not the only one. I love Mexican food and yet I completely forgot about Cinco de Mayo. Oops. This could be the coleslaw of my dreams! Going to try this this Summer! Amazing and vibrant ! Perfect photos ! Thank you so much ! 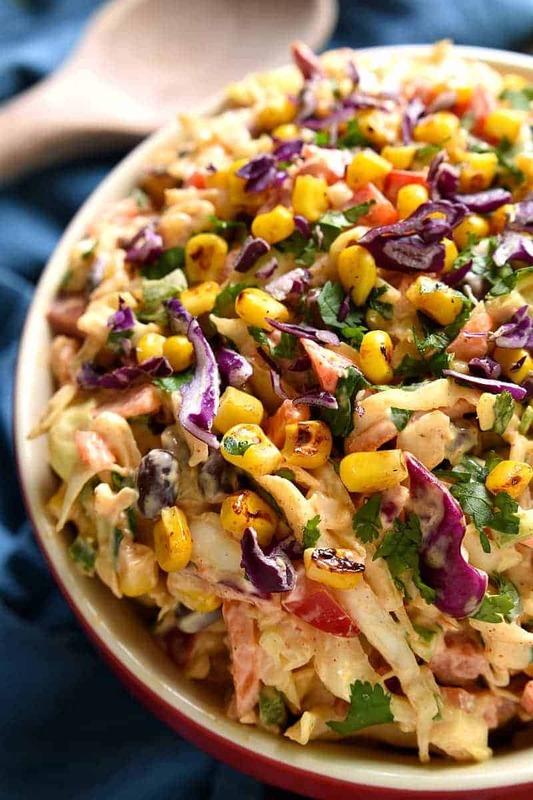 I love coleslaw salad but I never did this Mexican recipe. I love Mexican food because is so spicy and I can`t wait to try this recipe. Use any Daiya or soy product. Tofutti brand is my fave sour cream/cream cheese replacement. And, there are soy and almond plain yogurts now to use as a sour cream replacement. Mayo doesn’t have dairy in it. It’s safe. There are also dairy free yogurts. My favorite is the So Delicious brand. You can try dairy free yogurt and there is a egg/dairy free mayo. I have found it tastes similar. You could use vegan sour cream and mayo. Available at most organic stores. Made this for Mothers Day today. It is really terrific. What a wonderful salad to bring to a party or pot luck. I’ve never heard of this recipe but it seems so palatable, Cathy! Yummy! Just made this and it tastes really good! Will definitely make it again! Any idea the nutritional values? Weight Watcher points? I just entered this recipe into myfitnesspal with one adjustment. Traded the mayo for greek yogurt. Comes out to eight servings at 46 calories a piece. Before the substitution it was well over 100 calories per servings, but I forget the exact amount. Can’t wait to try it! This Mexican coleslaw is awesome. I added 1/4 cup of diced red onion for a little more flavor. What are the measurements on mayo, sour cream, lime etc?? Never mind . I see them . Thanks !! Looking forward to it .? You could used TAMED Jalepenos…. I love the flavor… but not the heat… I LOVE THEM!!! Can this be made and mixed together the night before? This was fabulous. Used healthy wraps and it was a total hit. Will be making this a lot. This was delicious. I made a vegan version by using vegan mayo & subbing non-dairy milk & a teaspoon of vinegar for the sour cream. I plan to make again for 4th of July. Thanks for a delicious and easy salad. How do I grill the corn? how far in advance do you recommend adding the dressing? how far in advance can you add the dressing? Made this tonight with a couple of substitutions– I used broccoli slaw instead of cole slaw and discovered we were out of sour cream so I subbed in plain greek yogurt. It definitely still works with those alterations, though it loses a little visually without the red cabbage. Very good, my wife requested we have it again. I just doubled this recipe and the taste is amazing! We are having it with Brisket, Ribs, and Deviled Eggs for the July 4th fireworks display! Happy Independence Day everyone!!! Family cannot eat cilantro. Any ideas what I could use as a substitute? I sub parsley for cilantro in everything. To me, cilantro makes everything taste like a cross between flowers and dish soap! Thank you so much for this recipe! Everyone here absolutely loved it! I made this it was really good. I used salt-free taco seasoning and it was great. I think it needs some nuts or something crunchy. I was thinking of crushed tortilla chips…perhaps the blue corn variety! Use roasted pepitas (pumpkin seeds)! Keeping with the Mexican theme whlie adding some more nutrients. This was amazing, Cathy–everyone loved it!!! I found refrigerating it overnight helped the flavors meld. It is such a fantastic twist on boring old cole slaw. I am making it again for a Friday night picnic–thank you so much for this wonderful and easy recipe that makes so many people happy!!! On Pinterest someone wrote they tried it with avocado and lime in place of the mayo and that sounds good to me. Wonder if it would look nice though and if it could be stored over night. I do celebrate Cinco De Mayo but usually by going to a Mexican restaurant and over eating. I am going to try this. Has anyone tried adding Fritos to this salad? This looks delicious! And it will go perfectly with the chicken dish I just finished. Thank you so much! Thanks, Gwen! Hope you enjoy it! Made this recipe using the greens we had in the fridge instead of cole slaw cabbage (which ended up being bok choy and romaine lettuce). It was delicious. My husband, son and I all loved it. Such a great non-carb side to any mexican entree and I’ll definitely be making it again. So happy to hear it! Thanks for letting me know! Do you only use cabbage or use the dressing mix that comes with it? Along with the mayo and sour cream? Looking forward to making it tomorrow. I do not use any dressing mix, just the shredded cabbage. Made this to go with enchaladas. Was delicious! Also it tastes delish. This is one of my regular sides!! Really? Mexican? Did you GO to Mexico and get this recipe? Did you buy a cookbook from Mexico and get it from there? This recipe is so totally alien to anythong remotely related to my country it’s almost offensive, you should name it something else… a Tex-mex salad, or a Mexico inspired side… you DO know we don’t eat coleslaw in México? Sounds GREAT! Can I make it the day before and how long can I keep leftovers in the refrigerator. Thank you Cathy. I am going to try this, it looks yummy. I may substitute salsa for the dressing if I don’t use the yogurt. Mayo is out if the question. I’m 58 and this is the first time I have ever posted a comment on a website like this, but after making this, I had to comment. I have to admit that I was expecting something good, but I just made a batch and even before the flavors have had a chance to blend, I couldn’t help but take a bite. It is delish! I will definitely be making this keeper again. Thank you so much! So good! I had pulled pork in the crockpot on a 7 degree winters day, and most of a head of cabbage in the fridge, needing to be used. As I wasn’t going out in that weather, I made do with what was in the house, so no red pepper, no jalapeño. Used 3-4 teaspoons of my own taco seasoning, and charred some frozen corn in a hot cast iron pan. The entire family enjoyed it, and I have printed the recipe for future use. And it will be used, again and again. Thanks! Excellent! Would also be great on shrimp tacos.